Africa is experiencing steady urbanisation, with over half of the continent’s population already living in cities. Phenomenons such as global warming, migration, demographic change and informality beg the question of who creates the city and shapes its future. How can investors, architects, urban planners, residents and informal settlers work together to build cities that are sustainable and serve their inhabitants? Francis Dibiédo Kéré’s loam architecture forms a cultural bridge between Africa and Germany – not as an export, but as a project of mutual exchange. Angola has witnessed lots of construction. But cultural spaces, and historical patrimony in general, have not fared so well. Photographer Lerato Maduna took to Johannesburg's major taxi ranks where she documented the daily life of taxi drivers. 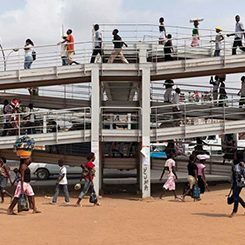 Symposium on building construction in Sub-Saharan Africa in the framework of the exhibition "Afritecture" at the Museum of Architecture in Munich - The Süddeutsche Zeitung reports. An interview with Andres Lepik, Director of the Architecture Museum of the TU München, on new buildings in Africa and the responsibility of architects. An exchange programme between Johannesburg and Berlin allows urban planners and architects to explore the principle of informality. Writer Guy Trangos wonders if the concept could ease some of the developing world's social ills. Africas cities are built very differently to those in Europe, and the new book Rogue Urbanism dedicates itself to these singular settlements. An existing informal pedestrian route next to Durban’s busy N3 motorway gets a roof structure made from the gutted shells of old cars, acknowledging the everyday practices of local commuters. UIA2014, says the director of the African Centre for Cities, offered a forum to “clarify what the global and intercontinental conversation should be, but also what the priorities for us as South Africans and Africans are”.